Former nursing home physical therapy assistant Kathleen Curry stands by the retaining wall behind the Nicholas County Nursing Home. During the evacuation, patients had to be lifted out of the water and onto the bank. June 24th, 3am. Outside Liberty Baptist Church in Richwood, a few exhausted staff sat silently smoking cigarettes in the dark. Power was out throughout the town - and no one wanted to speak to the media. Nursing home administrator Belinda Stear wearily agreed to speak for a few minutes by flashlight inside the church’s kitchen. “The water started rising, it was raining, we were watching the river just like we always do,” she said. Around 1pm Thursday, Stear made the call to evacuate residents to Liberty Baptist Church – which sits on higher ground above the nursing home. Stear has worked at the home for 18 years and says she has seen the building evacuated before. “We did a partial evacuation maybe five years ago, just a few people, and then the water started receding,” said Stear. JD Estep was a cook at the nursing home. He grew up in Richwood and has also seen the river rise before. That day, though, he says he had only one thing on his mind. The back of the Nicholas County Nursing Home several days after the flood. “These old people can’t swim. And even if they can swim there’s no way they can swim in these flood waters at 80 plus years old,” he said. Estep calls employees’ efforts to evacuate the residents “heroic.” The last residents were carried out the nursing home by staff – most of whom were women – and lifted four feet onto the upper bank of a retaining wall behind the building. “You know our main goal was to keep everyone safe and well, that’s what we’ve done,” said Stear. But in the five weeks following the floods, nine of the 96 evacuees have died. This is the third time the Nicholas County nursing home has completely flooded in that location. The first was in 1985. It flooded again almost 20 years later, in 2003. Then most recently on June 23, 2016. These statistics are not surprising considering that the home was actually built on a floodplain. The facility is now owned by Platinum Health Care. The corporation operates facilities around the country, including another nursing home in Worthington, West Virginia. Platinum did not respond to repeated requests for an on air interview, but said by email they are committed to reopening a nursing home in Nicholas County. That answer is of major concern to Richwood mayor Bob Henry Baber. “We need for the nursing home jobs to be here in Richwood. That’s actually a critical piece of our employment puzzle and taxes for the city,” he said. By critical, he means the business and occupation tax the city receives from the nursing home provides 10 percent of the city’s yearly budget. Baber said the town will provide land to the home that is out of the floodplain should they choose to rebuild within city limits. FEMA isn’t providing financial help to the facility since it is a private corporation. Platinum also is still not sure what kind of help it will get from insurance. Calvert said it is “highly doubtful” that Platinum’s insurance coverage will cover the costs of rebuilding or replacing. According to Platinum, reopening the facility at its current location would cost more than five million dollars. “It is hard to obtain an accurate number for rebuilding a facility,” said Calvert. “But you could estimate a new facility cost to be much more.” The goal, though, is to reopen as soon as possible. The amount of damage done to West Virginia's roads by recent devastating floods has reached almost $55 million. The state Division of Highways announced a revised road damage estimate Friday. The total is about $8 million higher than an estimate made by state officials on July 7, and about $19 million more than an initial estimate the week before that. A group dedicated to rebuilding communities plans to kick off a home construction project in White Sulphur Springs following devastating floods. A groundbreaking ceremony is scheduled Saturday on the site of Hope Village. 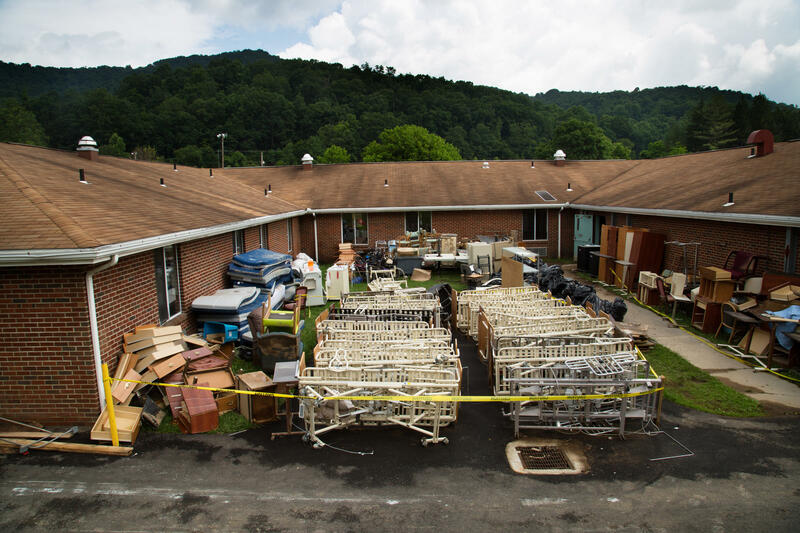 On West Virginia Morning, Appalachia Health News reporter Kara Lofton visits Richwood where flooding closed the town’s largest employer, a local nursing home. And Beth Vorhees talks with Inside Appalachia host Jessica Lilly about the radio show’s first step into television with a special about the June floods. It airs tonight on West Virginia Public Broadcasting.